Are you one of the parent who goes "We LOVE Play Doh... just not the mess that it creates." We share the same sentiments too. 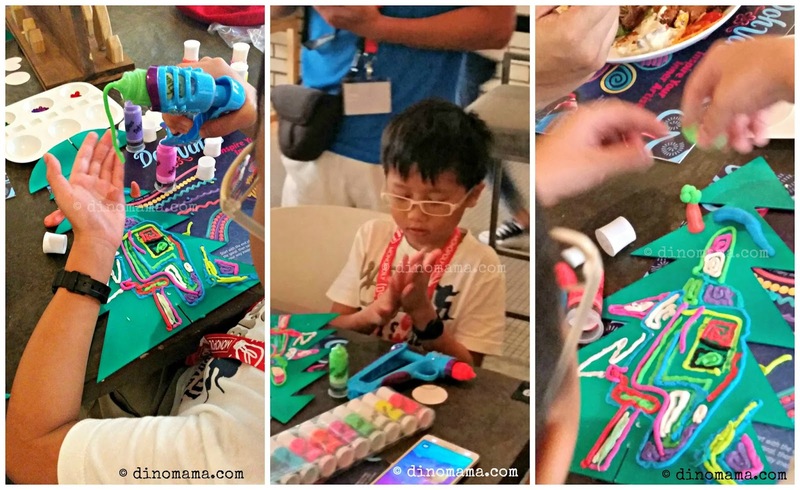 Recently the makers of Play Doh invited us to attend their play session so that we a chance to have a first hand experience with their new product Doh-Vinci, where we will be having a fun time and creating our very own 3D art designs; here's the catch - minus the mess. What? Wait did I read wrongly? No Mess?! I'm in for it and perhaps for once we can have the best of both worlds, fun time for DinoBoy and no after math clean up for this Mama. We were both very excited when the day finally arrives, we met many little Doh Vinci artists at the play session. 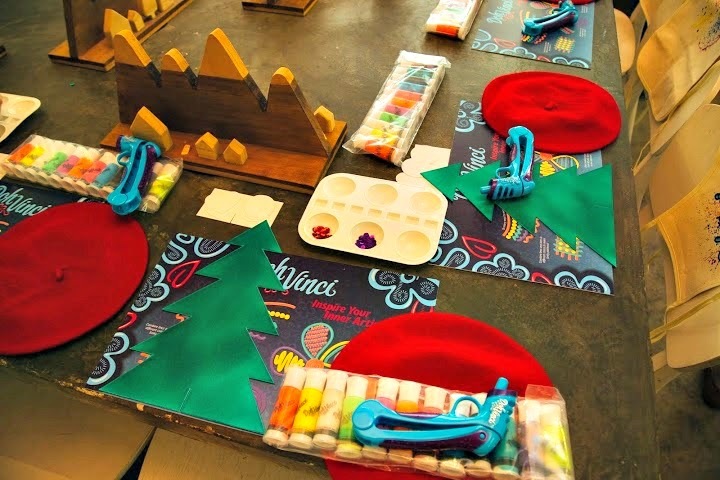 Look at the things they prepared for the kids to use, I love the vibrant colored deco pops~ they even included a little cute red beret to complete the perfect artist look. DinoBoy couldn't wait to get started, he did not even listen carefully while the nice people from Doh Vinci was introducing the product and teaching the kids how to use them correctly. Actually it was very simple to use as you can see from the photos below; just choose a deco pop color you want to use, pop it into the Styler, aim & squeeze the pop color out and create your 3D design! And since it says "3D", DinoBoy decided to bring it up a level by making a tree and stick it on top of his Christmas tree. Doing it like a pro, he simply just squeeze an ample amount of deco pop onto his palm, shape them and create~ What to love about Doh Vinci is that it does not leave an eeky yucky residue on your hand after you handled them. The people behind this Doh Vinci is really a genius as they have created a product that really unleash our inner artist. The design compound are not limited to be used on their board kits only, they can be used on other surfaces too! 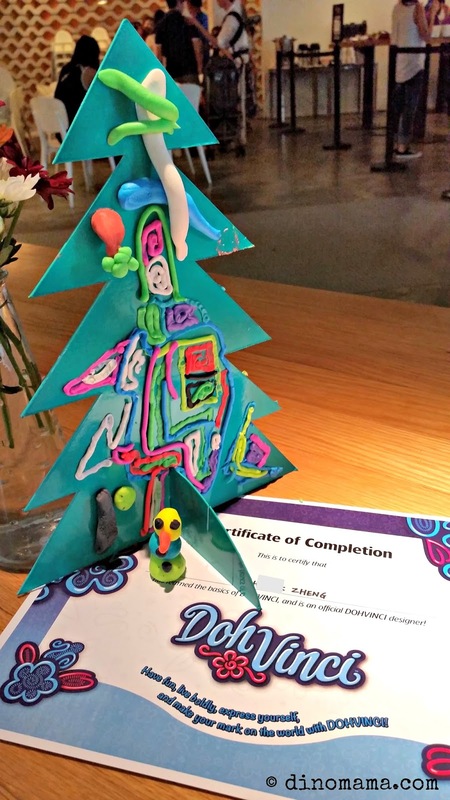 Here is DinoBoy's beautiful Christmas Tree accompanied by a colorful snowman and completed with a Certificate of Completion from Doh Vinci. He is officially a Doh Vinci Artist. Check out the range of Doh Vinci products over here, we like that they have a good range where the girls AND boys can enjoy playing it for hours. 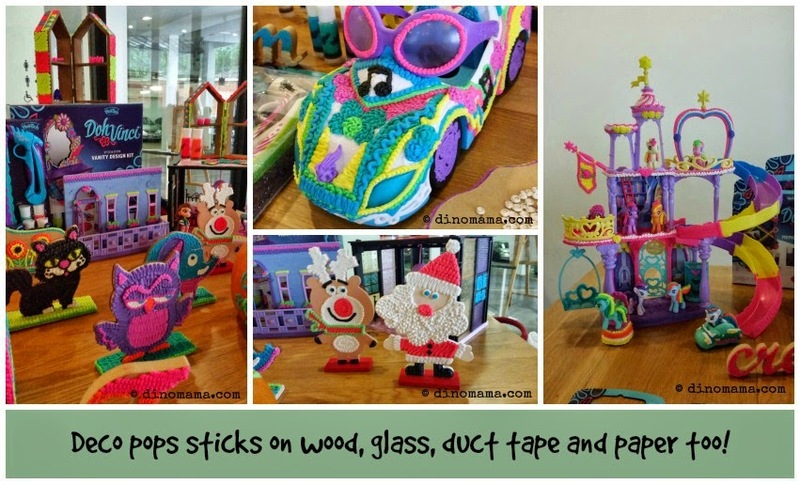 Christmas is round the corner, if you have no gift idea to get for your kids or your little nieces and nephews, we strongly suggest that you grab some Doh Vinci kits. Some of the kits comes with inspirational guides in case the kids got stuck on ideas. If you get these kits for the kids, they will love you to bits and crown you the Best Mummy/Daddy or Best Aunt/Uncle of the Year. Of course we are getting a set or two for DinoBoy this Christmas but sshhhhh~~ don't tell him that, it's going to be a surprise for him. 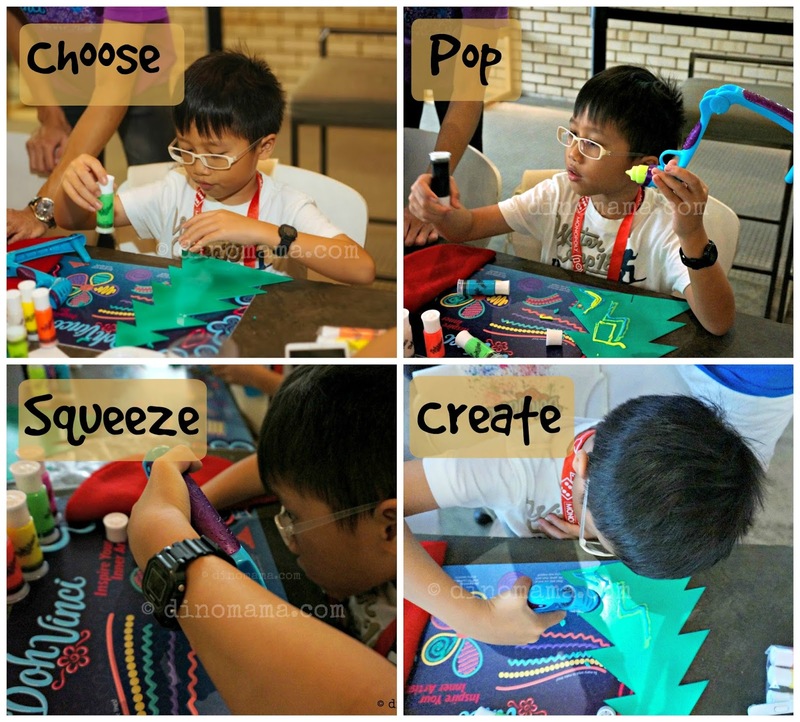 And since we are such a nice and considerate family; self proclaimed or not is not important hahaha~ we decided to start you and your child onto your creative journey with Doh Vinci by asking the really nice people at Hasbro Singpore to sponsor the DinoFamily 2 sets of Doh Vinci hampers for our "In Celebration of an Awesome 2014 Giveaway". - Winners will have 3 days to respond by replying to our notification email otherwise, a new winner will be picked. - Winners will be contacted by Hasbro Singapore directly via email for collection of prize. Prize must be collected before Christmas. The DinoFamily's responsibility will end once we pass the winners' details are to Hasbro Singapore. Disclaimer : We are in no way affiliated to the staffs and management of Hasbro Singapore. We attended the Play Session with Doh Vinci and accepted a goodie bag during the event. No other compensation was received for the purpose of this post. All opinions are 100% ours and photographs belongs to DinoFamily unless otherwise credited accordingly. My favorite is the Anywhere Art Studio Easel! The DohVinci Anywhere Art Studio Kit. A7198 DOHVINCI ANYWHERE ART STUDIO Kit is my kid's favourite. I like DOHVINCI ANYWHERE ART STUDIO EASEL AND STORAGE CASE SET. Me and my daughter can have fun time together. 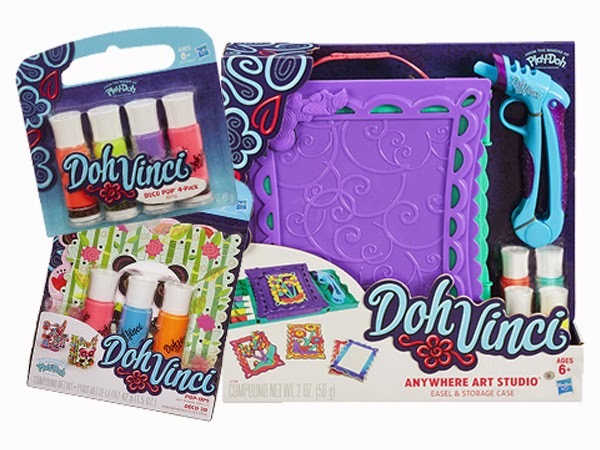 The DohVinci Anywhere Art Studio Kit. Thanks! My favourite is DonVinci Anywhere Art Studio Kit. I like Anywhere Art Studio ! I like DOHVINCI Anywhere Art Studio Kit. DohVinci Style & Store Vanity kit. I like the DohVinci Anywhere Art Studio Kit. My girl loves PlayDoh, this kit would help unleash her creativity besides just rolling them into balls! DohVinci Anywhere Art Studio Kit. My girl likes the DOHVINCI STYLE & STORE VANITY COMPLETE DESIGN KIT.